The grand and complex cliffs and buttresses of Etive Mor, Etive Beag and Bidean nam Bian tower over Glencoe, their mountain spurs thrust into the glen like raised knuckles. There are intricate corries, hidden caves and narrow ridges to find while reaching the summits which afford spectacular views. We're here on a guided adventure over 3 days exploring these impressive mountains. 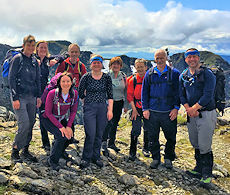 A guided hill-walking and hiking 3 day event in on the mountains south of Glencoe in the Central Highlands with one of our experienced and qualified leaders. From the eastern entrance to Glencoe, Buachaille Etive Mor (Big Shepherd of Etive) is both grand and intimidating. The northern Munro summit of Stob Dearg hides other peaks behind, with a long sweeping crest leading to the other Munro summit of Stob na Broige on the mountain. 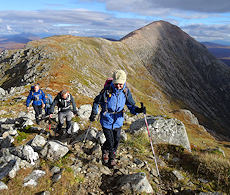 To bag both these Munro summits makes for an enjoyable, high-level mountain-hiking day ! Our day begins on a fine path from Altnafeadh at the entrance to Glencoe. Higher up nature continually erodes and moves the coire's scree causing the path to occasionally disappear. We'll show you the best way to tackle this and get onto the mountain's crests. 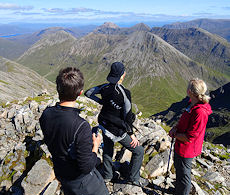 Higher up, the views open up beautifully with Buachaille Etive Mor's summit Stob Dearg being a stunning place to take in the vast expanse of Rannoch Moor and the mountains to the north and west. We'll continue hiking along Buachaille Etive Mor's crest, aiming for its southern Munro peak, Stob na Broige with its fine views down Glen Etive. After dropping down to the Lairig Garten, it's decision time we'll pick up a path hugging the River Coupall to return to Altnafeadh. Bidean nam Bian is a massive and complex mountain towering above Glencoe. There are many routes, detours and minor summits, so what is the finest way up this complicated mountain ? On this day let us take you up an excellent route onto the crest, bag Bidean nam Bian's summit and Stob Coire Sgreamhach, the other Munro on the ridge and return out via the hidden 'Lost Valley'. From near the head of Glencoe, we'll begin our day with a hike up Coire nan Lochan passing some lovely waterfalls to reach Stob Coire nan Lochan. Some rough terrain, though nothing difficult, leads us onto the summit of Bidean nam Bian to enjoy some amazing views. Some easy scrambling next, we'll head over to the other Munro summit in the range - Stob Coire Sgreamhach. Our descent takes us out through the famous and enchanting 'Lost Valley' and we'll return back to the roadside. A rugged little mountain, not as impregnable as initial impressions give ! Like its big brother Etive Mor, Etive Beag appears quite impregnable from the Rannoch Moor approach. However, head around the west side of the mountain and an ascent looks much less intimidating - grassy slopes lead to a long ridge with two Munro summits at both ends - Stob Dubh and Stob Coire Raineach. We'll begin our day from near the head of Glencoe and strike uphill on a well-mainained path. Higher up, we'll gain the crest of the mountain and from a col, clamber up rough and loose ground to gain our first Munro summit of the day, Stob Coire Raineach. Returning to the col, we'll follow the line of the Etive Beag's crest up onto our second Munro Stob Dubh. We can return the way we came up, or for more enjoyment, extend our day by detouring to the head of the Lairig Eilde for a fine walk our through this lovely glen. The routes have good paths lower down leading to rugged terrain higher up. Some of the terrain is quite rough, especially on the first two days, though none difficult enough to be graded rock-scrambling. The distance and ascent on all the days would have us classing them as 'moderate', however the Bidean nam Bian day is bordering on 'demanding'. Leading the event on 5-7 October'19. The Glencoe mountains are a few miles west of Kingshouse Hotel on the A82. There are bus services that run between Glasgow and Fort William to Kingshouse Hotel (see http://www.citylink.co.uk).